"Holiday rental specialist since 1988. Villas, farmhouses and holiday homes in Tuscany, Umbria and Lazio"
The Etruscan town of Cortona, every year between the end of August and the beginning of September, hosts the old antiques fair “Cortonantiquaria”. The charming fair takes places in the rooms of the historical Casali and Vagnotti palaces. 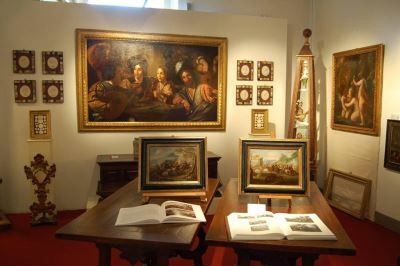 Over the decades, the event, which originated in 1963 under the administration of what was then the “Azienda Autonoma di Soggiorno e Turismo di Cortona”, has given hospitality to the most important Italian antiques dealers. The idea was one of the first initiatives promoted by the Azienda, and by its first chairman Professor Spartaco Lucarini, who wanted to give notoriety to the historic capacity which distinguished Cortona’s wood craftsmen over the past times. Cortona thus came to be visited by 2500 antiques enthusiasts, and the success was such as to justify the organization of all the other editions, down to our days. At present the exhibition is no longer characterized solely by the presence of local antique dealers and collectors, but rather the choice of these has begun to include experts in the sector from all over Italy. In the appropriate historic contexts of the beautiful noble rooms, not only prestigious specimens of wooden furnishings, but also antique jewellery and very delicate crystal, sculptures and pictorial works of various types, as well as medieval ceramics and rare carpets, are to be found. The importance of the pieces on display attracts thousands of visitors today, who pass through the exhibition with the same attention that they would dedicate to a museum. Many go there in search of rarities that are not easily found elsewhere, while others loose themselves in the suggestive variety of the collections. Cortonantiquaria (cortonantiquaria.it) has numbered editions with more than 50 highly-selected exhibitors and crowd peaks of about 20,000 visitors. This is because many lovers of this city, be they Italians or foreigners, do not let the opportunity to return there slip by, precisely in the light of this important event. Take the opportunity to visit "Cortonantiquaria", the town of Cortona with its monuments and masterpieces during a stay in one of our beautiful villas with pool in Cortona!! !